Q: Why are you called “the bearman”? A: HA! Well……it all started back in the early 90’s. At the time, I had a lot of requests from local elementary school teachers to come in and speak with students about the bears in Yellowstone. The mom thought this was funny and told her friends and with Big Sky being such a small community it wasn’t long before everyone was calling me the “bearman” and it stuck. Q: What is the best spotting scope and tripod? A: I have used or tried just about every spotting scope on the market. Click here to view. Q: Do you provide transportation on your tours? A: Yes, I am licensed with the park service to use a 2000 Luxury Touring Chevy Astro Van, All-Wheel Drive for all tours. Transportation is provided to and from meeting locations. A: Most guests and visitors fly into (BZN–Gallatin Field) Bozeman, Montana, but a few fly into Salt Lake City, Utah or Jackson, Wyoming. and then drive north. During winter months, Bozeman, Mt is the closest airport (access to the northern and western range of the park). Q: Can you send us a brochure? A: Sorry no. As of January 2005 I stopped printing brochure’s. 100% of my business is obtained from this web site or repeat clients. Q: Do you offer overnight backpacking tours or just day trips? A: I am licensed with the park service to lead only day tours. Guided overnight back country camping trips are led by licensed local outfitters. Check with the park service for a listing of licensed overnight camping tour guides. Q: Are the tours you lead large tours or small, one on one family style tours? A: Just small custom private charter tours. If you hire me for a tour, you and whoever else you bring along will be the only guests I have for that particular tour. You pay a little more for this one-on-one service, but the benefits far outweigh the negatives. Q: I’m just one person. Can I join in on someone else’s tour? A: Sorry unlikely, but I can try my best to accommodate you. I’ve found that most guests would prefer, and often ask to not have others added onto their tour and are willing to pay for the more private service. There are larger sized bus tours offered by Xantara services and several larger tour companies at most entrance communities that you can climb on if your looking for a large group tour. Please keep in mind that with bus tours, you will be packed onto a 15-40 passenger bus and driven around the park making regular stops only where they can park a bus. What sort of experience you end up with is totally dependant on the driver/guide and the dynamics of the group. Q: Is one day enough for viewing wolves or would you recommend 2 or 3 days? A: Its a roll of the dice what type of wolf tour you end up with. How close the wolves get to us, whether we see them hunting, howling, etc…….Each day is different. Some folks get lucky and are rewarded with everything their first day out and some folks have to work a bit harder and spend a few days. Its up to the wolves, god, karma, etc……..
Q: Do we have to rent a car once we arrive or is there public transportation to Yellowstone? A: You would be better off having your own car while you are here visiting. The only other transportation available is a private taxi company which will pick you up at the airport and drive you to any location you want to go but it’s very expensive, and, after they drop you off you’ll be stranded with no way to get around. Q: During winter can we take a bus or vehicle into the main part of the park and see geysers or other areas? A: The park is closed to wheeled vehicles from November till mid-April, but you can climb on a snowcoach tour or rent a snowmobile to see the major attractions. As of the 2002-03 winter season you are required to hire a snowmobile guide if you choose to ride snowmobiles. Snowcoach tours are led by the guide/driver. Q: Will we need to rent a 4X4 during the winter months? A: No, a standard car will do just fine. The highway dept. does a good job keeping the roads clear. The snow plows outside of the park operate 24 hours a day during winter months. An all wheel drive vehicle is safer, and the best choice. Q: Can you take care of our flights and make the arraignments for us? A: Sorry, no. I have no connection with airlines or flights. Please contact your local travel agent or do a search online. Q: Can you tell us where we can see wolves without hiring you? A: Doubtfully. Wolf packs move too much to predict where they might be on any given day in advance. Which pack I take my paying clients to see and what location we go to varies each day, sometimes 25+ miles apart day to day. I don’t even know where we are going until we get there. Q: How close do we get to the wolves? A: Its not how close we get to the wolves, but how close the wolves get to us. It is totally up to them and how comfortable they feel. There is no way to predict in advance how close of a view you might get rewarded with on each and every tour. Q: Can you tell us where you take people to see bears so we can go on our own without hiring you? A: No. The danger level for you going on your own would be too great and I would be held responsible should you get mauled or killed. Plus, those locations are very sensitive and if I gave this information out the sites would quickly overcrowd, then have an adverse effect on the bears forcing the bears to move from the area. Q: Where do you meet guests per tour? 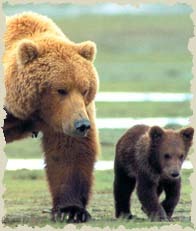 A: Bear Viewing Tours: I meet guests for this tour at Canyon Visitor Center. The closest lodging is at Canyon, but Lake Hotel is not too far away. Full Day Park Tours: I can meet you in West Yellowstone, or Big Sky, Montana. Old Faithful and Canyon Lodge also work. I prefer to start the tour from the West Entrance though. Winter Wolf Tours: I meet guests at the Mammoth (Albright) Visitor Center. The closest lodging will be in Gardiner, Montana or Mammoth Hotel when open. If you are lodging at Mammoth Hotel I can pick you up there, and I often meet guests in Gardiner when I am also lodging for multi-day wolf tours. Q: I am hoping to get full frame, full faced shots of grizzly bears. Can I expect to get this on your bear tour? A: Doubtfully. If full framed full faced photographs of grizzly bears is your main goal, then I would have to recommend your local zoo unless you can afford a Nikon 800mm lens. A few guests with Canon XL-2 digital video camera’s have been able to “reach out there” and capture these shots. Otherwise, the bear tour is more of “an experience, and unique adventure”. Q: Is Old Faithful Inn open all year? A: No. The Old Faithful Inn is closed from late Sept. until early May. It would be impossible to heat the interior in winter. The new Old Faithful Snow Lodge is open basically year round, closed only when the park is closed. Q: What trails can we ride our bikes on? A: There are only a few available. You would need to stop in at the nearest Visitor Center once you arrive for maps, and regulations. There are so few available that I’m not sure it would be worth the effort to transport the bikes and the few that are legal to ride on are only a mile or two in length. You can ride on any road surface in the park, but I’m not sure I would recommend doing it. Several large bike tours lead groups along the parks twisting and winding roads during the summer season and I have seen many near misses between bicyclist and RV or car. Q: Can we go anywhere we want in the park? A: Yes, you can park your car and just take off cross country if that is what you would like to do. There are some exceptions to that rule. In geyser basins you must stay on the board walks. In the past, visitors have wandered off of boardwalks and been burned by the hot thermal waters. If you are hiking on a trail and find yourself in a geyser basin or thermal area, be very cautious. Stay on the trail. Remember, your safety cannot be guaranteed. Most burn victims were injured off trail. The other exception to the “open” rule would be a seasonal closed trail or area, which sometimes happens due to some danger like grizzly bears feeding on a carcass, rock slides, hot unstable ground, etc..
Closed areas are generally well marked, so the chance of accidentally wandering into a closed area is low but its always a good idea to check with a visitor center,…… or at very least the nearest trailhead and read over the information board located at each trailhead and look for any danger or warning posters or notices. If you decide to park and take off cross country always leave some identification where it can be easily found. I generally leave a note up on the dash where a ranger could read it, explaining where I was headed and the time and date. You never know when some accident might happen and leaving a note on the dash might just save your life. Q: Are there TV’s and telephones in the hotel rooms within the park? A: In the new Old Faithful Snow Lodge I was told that there are phones in each room In all other hotels within the park there are no phones in the rooms (as far as I know), however there are pay telephones available in the hallways. There are only a few rooms with Televisions. I know that there are a couple of rooms at Mammoth Hotel with TV’s, but as far as I know that is the only hotel with that service. Q: Is there train service to Yellowstone? A: Yes, and no. The nearest AMTRAC station is located in Idaho Falls Idaho. There is also a station near the west entrance to Glacier National Park, 6-8 hours north of Yellowstone. Idaho Falls is about 2 hours south of West Yellowstone, Montana. Q: I’m doing a book report for school. Can I send you questions? A: Yes, but most answers can be found on my web site. If, after you read over the site and still have questions please keep them brief and to the point. It can be a bit overwhelming at times, I average 200 emails a day. I will not do your book report for you. You will still have to do the work. Q: Can we camp anywhere we want inside the park? A: No. You will have to camp in a designated campground. In the backcountry you will have to camp and use established campsites. You will need to sign up for a back country campsite in advance, and sign some paperwork. Read over the info. I have on my camping safe with bears page for more detailed information on back country camping fee’s and regulations. Q: What is the busiest month in the park? A: Historically August has been the most crowded month. However, the last week of June has been the busiest period the past few years. Fourth of July week and Mothers Day can be a bit busy too. Q: Where can we feed bears? A: Not in Yellowstone! It is illegal to feed any wildlife in Yellowstone park…… including birds. Q: We only have about an hour or two to see everything in Yellowstone. Can you take us? A: Your not going to see much in an hour or two. You might be able to see Old Faithful erupt…….if your lucky and driving from West Yellowstone. The park service recommends that you plan on spending at least 4-5 days on the lower loop and 4-5 days on the upper loop to see most of the major attractions. The minimum amount of time I need to guide you through the most popular attractions on the lower loop and have fun, is 8 hours. Q: Can we howl at the wolves? A: No. Howling, hooting, or other attempts to get wolves or other wildlife to respond is illegal and you could receive a citation if caught. Do not howl at the wolves. These activities can disrupt the natural flow of wildlife habits as well as annoying to other visitors. Please respect the wolves and other nearby visitors. Q: What is “bug dope” and where do we buy it? A: Bug dope is just slang for bug spray for your arms, legs, etc…….You can buy bug spray at any outdoor store including Wal-Mart, K-Mart, etc…………Just look in Sporting Goods, there are generally several to choose from. The brands with a higher percentage of Deet work best, but are also more harmful. Choose carefully and use sparingly.